TV hasn’t quite caught up with the new media age. The old notion that you could stage-manage party conferences (Peter Mandelson-style) has crumbled under the pixels of smart-phones. 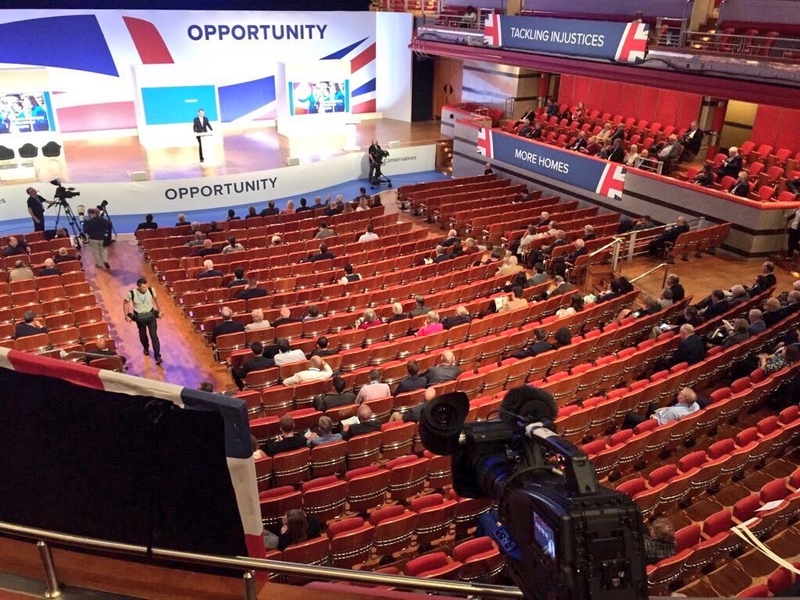 As everyone carries a camera the ability for political parties to project power through broadcast media is over, so we see the end-game-players of British Conservatism talking gibberish to the last vestiges of their membership in empty halls. This is what a dying political party looks like but also what a dead politics looks like. What gibberish am I thinking of? As Jeremy Hunt compares Brussels to the gulag, here’s six top spots from the Tory Conference, you could call it the Birmingham Six? Wait, what? Was Davidson on the verge of becoming First Minister? How so? When did this happen? Saving the Earth. Michael Gove told the Tory conference today that the government will “reverse the destruction” of nature. Sounds great. Unearthed reveal the reality. Blockchain and the Good Friday Agreement. We’ve had Zeppelins and drones and microchips and now Blockchain will resolve the ‘Irish Border problem’. Reuters report Philip Hammond suggesting that a solution to providing frictionless trade across the Irish border after Britain leaves the European Union might be found using technology such as Blockchain:”There is technology becoming available (…) I don’t claim to be an expert on it but the most obvious technology is blockchain,” Hammond said when asked about how the government could achieve smooth trade after Brexit. Desperate, much? Does your grandchild help you with the video controls? The Anti-Meat People. Daniel Hannan is getting angry. The Mirror reports:”People who want to block chlorine-washed chicken from UK supermarkets are “anti-capitalists” who “don’t like meat”, according to Hannan.”Daniel Hannan blasted criticism of the US food-washing regime – which he wants to be allowed on imports to Britain after Brexit .Using chemicals to disinfect poultry is currently banned under EU rules, but is common in the US.”Whilst its true that there is an anti-capitalist analysis of the role of meat consumption, climate change, ethics and the psychological damage of the late-stage capitalist food industry, Mr Hannan wasn’t quite grasping that. Instead it was all a left-wing media conspiracy (you know, that left-wing media). The Mirror explains:”MEP Mr Hannan has faced fury for putting forward an “ideal” US-UK free trade deal that would allow the practice – and allow US healthcare giants to run parts of the NHS. Tonight he hit back, claiming “anti-capitalist journalists” and the “leftist press” were scaremongering and companies wouldn’t poison their customers anyway because it’s a “bad business model”.I mean I suppose it is a bad business model, but that’s kind of a low bar ethically-speaking isn’t it? Isn’t he saying here that poisoning people would be okay if it wasn’t bad for business? It’s not exactly the sunny upland is it? Automatic for the People. Theresa May’s former policy chief – George Freeman MP – has called for 850,000 public sector jobs, including half a million in the NHS, to be “automated”. The Taxpayers Alliance chief Andrew Allum explained how it would be a “win” for the sacked workers as they’ll be freed from doing “mundane jobs”. UK Business Insider has the story here.It’s confirmation of the privatisation strategy planned by the Brexiteers, rolled-up in some barely understood techno-gibberish regurgitated to nodding heads fresh from the beige buffet.There’s a thread of techno-madness running though this years Tory conference. Is it Nathan Barley SPADS propping up void politics from ministers completely out of their depth? But just remember folks, if the Scottish Tories can stop Boris Johnson becoming PM then Ruth will be our new First Minister! I don’t claim to be an expert on it but this is pure gibberish. Correction – they are not running on empty, they are running on the smell of it, that is the smell coming from their own under-pants. I hope you are right about her chances. I think she is extremely sleakit. Yessers can see how she successfully avoids all difficult questions. But most people are not paying close attention or analysing her cosy relationship with the media. I hope Im wrong but with Trump in America and Brexshit here anything is possible. Two American friends were visiting during the presidential campaign. Like many they simply could not imagine Trump winning. I was following things closely and put a bet on that he would. I believe many former Labour voters would now vote for Ruth. Friends I have known a lifetime, when asked, have told me ‘they like her’. If Labour doesnt get its act together they will see her as the only option. These are people over 50 who to my mind are no longer following the ins and outs of politics , couldn’t tell you a thing a bout her policies/beliefs but have seen her on TV being jolly on all their favourite programmes. I dare say Hello magazine will be full of baby pictures soon too. I think the YES movement should not be complacent in thinking she will never be First Minister just because she is a Tory here in Scotland . Labour are a mess and if people feel they would like a change who else is there? Just because I absolutely cannot bear the thought of a Tory winning power here doesnt mean it can’t happen. Great points but one thing…how can you call people that like Ruth Davidson friends? Despite Colin Mackay’s sterling efforts at actually being a journalist, the mainstream media continue to drool over her. Her fan base in the metropolitan ‘progressive’ media is large. The New Stesman site has another PAEAN to her this week after, three last week. With the stushie over Keshia Dugdale’s legal fees and Iain Murray’s increasingly contemptuous attack on Mr Corbyn Labour in Scotland are exposing themselves for the solipsistic they are, fighting like ferrets ina sack. Many Labour voters in Scotland do not want to vote for such a selfish shower and, since many are unionists, Ms Davidson is the unionist flag bearer. Her repeated mantra, ‘get back to the day job, ‘ is amplified daily by the Scottish media with continuous horror stories in the NHS, in Police Scotland, in education, in transport. It resonates with many former Labour voters. At the Tory conference, Jeremy Hunt compares the EU to an old Soviet Union Gulag as it (according to him) attempts to prevent countries from leaving. At the same conference, Ruth (saviour of the Union) Davidson claims Scotland will not be permitted another Independence referendum under a Tory Govt. Ruth Davidson :- Scotland’s Jailer. No mention of this in the main stream media …. how odd. On your point 4, I read earlier this year that food poisoning incidents in the USA, relative to population, is at about 10 times the rate it is here. Doesn’t that suggest that the American food companies are getting away with poisoning their customers? “Masses ranks of the EU 27”, No, Ruth, they are only negotiating with Michel Barnier and his team appointed by the EU Commission, Not the entire 27, even though Teresa May sent her Ministers during the summer to various EU countries in a cack handed attempt to undermine Barnier . It’s all so depressing that I can’t even think of anything to say. I can’t even think of a reply. Yes, well done, Colin Mackay on STV. I’m sure the British Brainwashing Corporation won’t be offering him a job anytime soon.